New Vancouver-based social good startup FlyingFlips is changing the way you buy FlipFlop sandals. Already featured on popular websites such as Mashable, Yahoo and Techvibes, FlyingFlips creates artist-designed FlipFlops that give back to both the Artist and those in need. The recent launch of the companies Kickstarter campaign enables customers to pre-order a pair of FlipFlops, while also providing the company crowdfunding for creation of their online store and other expansion objectives. The FlyingFlips concept: artists and designers create and submit amazing designs, the FlyingFlips community votes on which designs they like best, the top voted designs are then printed as flip-flops and sold in the company’s online store. 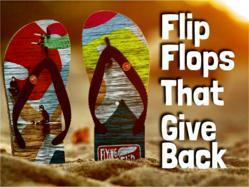 To top it off, a second set of FlipFlops from EVERY pair sold is given to a person in need. The artist also gets a percentage of sales generated from their winning designs. The passion of the company is displayed in their efforts to ensure that every contribution counts. FlyingFlips has partnered with two charities, Soles4Soles and Fundacion A. Jean Brugger. Soles4Soles is a US-based organization that collects footwear from companies and individuals and distributes them to people in need around the world. A. Jean Brugger Fundacion is a non-profit foundation located in San Juan del Sur, Nicaragua that is devoted to providing critical educational opportunities and vocational training for the youth of San Juan del Sur and surrounding communities. “Every week there are new designs, every week there are new people that I connect with, every week, there are new opportunities to help others,” says Paul Mon-Kau, FlyingFlips Co-Founder, “It’s a never-ending series of creations”. Want a pair of FlyingFlips now? Well that’s not a problem, because FlyingFlips has recently launched a project on Kickstarter, a crowd funding website for creative projects. Kickstarters can donate between $1 and $500 to pre-order the ultimate in FlyingFlips swag, including items such as, the limited edition, artist designed FlyingFlips, bandanas, t-shirts and much more. The Kickstarter campaign, which runs until the end of May, will fund the first run of flip flops and the creation of the online store. The store will launch one week into June, right after the Kickstarter ends. At its roots, FlyingFlips is a crowd-driven site: a community for art & design, a platform for social change, and an opportunity for indie artists to get paid for doing what they love. FlyingFlips creates artist-designed FlipFlops that are produced and sold with a commitment to giving back. Ivo Statiano and Paul Mon-Kau founded FlyingFlips in 2011. This entry was posted on Wednesday, May 9th, 2012 at 11:14 am and is filed under Business News, National News. You can follow any responses to this entry through the RSS 2.0 feed. You can leave a response, or trackback from your own site.